SHINE’s luminous surface was developed to show through most printing inks, and enrich any design. SHINE is FSC certified, recyclable, biodegradable, acid free, and elemental chlorine free, and is manufactured without the use of metals or foils. 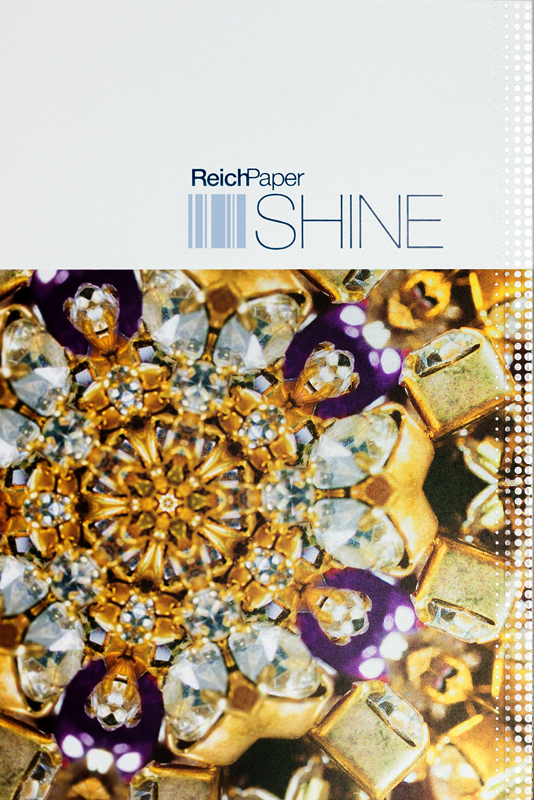 SHINE is a specialty paper and, as such, does differ in some aspects of printing from conventional coated and uncoated papers. SHINE will perform beautifully when used as recommended. As with all papers, it is important to consult your printer and pretest before trying anything new. Please contact us to request samples, or discuss any aspect of your project. Caliper is a measure of the thickness of a sheet of paper (1 pt. = 1/1000 of an inch). Below is a list of basis weights and corresponding calipers for SHINE. 80# Text 120 6 pts. 92# Cover 250 12 pts. 107# Cover 290 14 pts. 137# Cover 350 17 pts. Offset: SHINE’s lustrous effect is intended to be visible through the printed image, though heavy ink densities may somewhat diminish the effect. SHINE is less absorbent than standard uncoated papers, so general process inks are not compatible with this specialty stock. Drying times will be longer than for standard papers, and this should be factored into the production schedule. Inks: SHINE is a specialty substrate, and conventional inks are not suitable for printing on this stock. 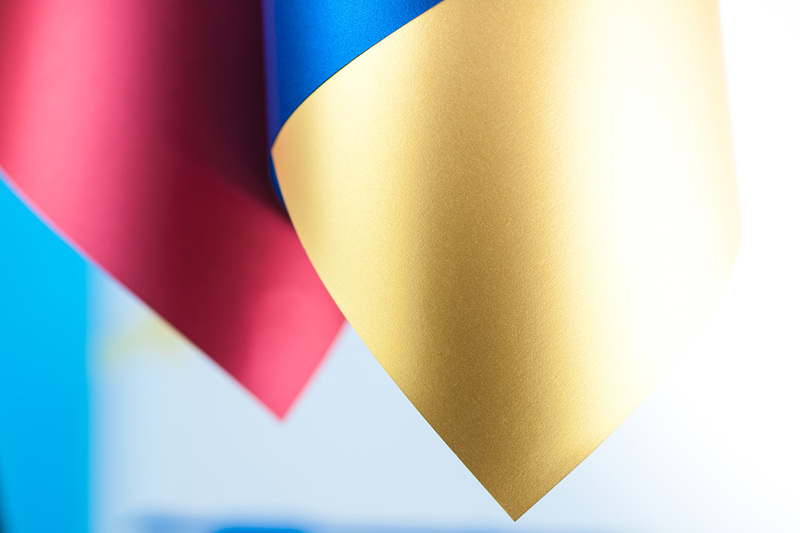 Fully-oxidizing or UV-curing inks must be used when offset printing on SHINE. Drying results will be faster for UV inks than for fully-oxidizing inks. Laser: SHINE is suitable for laser printing. As for any paper, pretesting is essential as performance may vary from one printer to another. Ink Jet: SHINE is suitable for both monochrome and color ink jet printing, but results will vary from one printer to another. As always, it is important to pretest on the actual printer to be used. Digital: SHINE Pearl Digital and Champagne Digital 80# Text and 107# Cover, as well as Silver Digital 80# Text and 92# Cover are certified for use on HP Indigo digital presses. Standard SHINE has been run successfully on other various digital presses, such as Kodak NexPress, Xerox iGen, Xerox 800-1000 and Konica Minolta C6500. 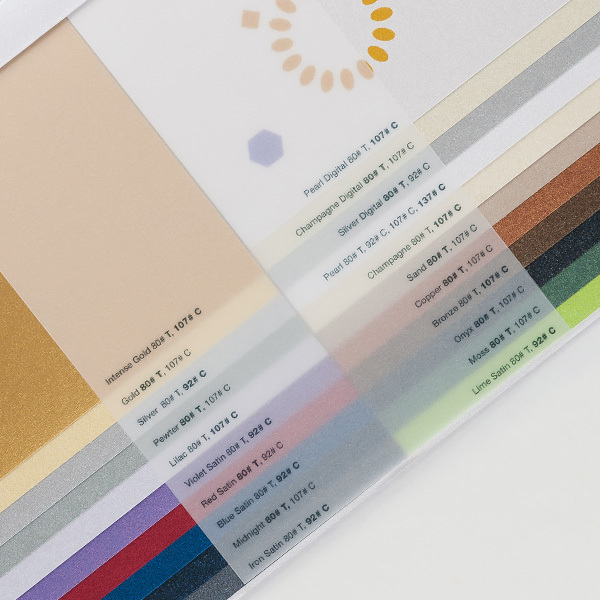 Color Separations: SHINE will print somewhere between coated and uncoated paper. We recommend using curves closer to that of coated paper. The total area of coverage should not exceed 260%. Grain Direction: Our paper stock charts list all sheet sizes with grain direction last. As for all papers, binding and folding SHINE parallel to the grain direction is always recommended. Line Screen: In general, line screens ranging from 150-200 are used for printing on SHINE. It is always advisable to consult with your printer to determine the appropriate line screen for your project. UCR: For areas of heavy, layered ink coverage, such as blue or black, consider the use of UCR (under color removal) in scanning. This will decrease total ink density, and can cut drying times significantly, especially for black. Storage and Handling: As for all papers, avoid exposing SHINE to extreme humidity or temperature conditions, and keep in the original mill wrapping as long as possible prior to use. Fountain Solution: When printing on SHINE, it may be helpful to increase the alcohol substitute, using more than one would use when printing on conventional papers. This may allow the printer to run up more ink on SHINE, thus making colors more vibrant. Spray Powder: Spray powder may be used to prevent offsetting; a coarse particle size is recommended. Stack in small lifts, as some airing of the stack will be beneficial for ink drying. Varnish & Aqueous Coating: While SHINE may be varnished or aqueous coated, please keep in mind that any varnish or coating will likely alter SHINE’s luminous appearance. Varnishing or aqueous coating SHINE after printing, as for any paper, can help to protect and seal the printed area, especially for projects where finishing is complex. Foil Stamping: SHINE foil stamps beautifully. Scoring & Folding: All SHINE weights (80# text, 92# cover, 107# cover and 137# cover) should be scored prior to folding to ensure the best fold. As for all papers, folding with the grain direction is preferred. We recommend a rounded channel score with a minimum width of 2.5 times the caliper of the sheet. As for any secondary print or finishing process, if gluing over a printed area, other variables come into play. It is always best to glue an unprinted/unvarnished area; if it will be necessary to glue over a printed area, please ensure that the inks used are wax free. Please contact us if you have any questions about the Printing and Use information included here, or need information about any other topics. SHINE is a specialty paper and, like any substrate, should be fully tested prior to use, especially if trying something for the first time. We have endeavored to address most aspects of printing and use here; however, we do not accept liability for any errors or omissions. Should you have any questions, or need any additional information, please contact us at 718.748.6000.